Remixologie is one of the newest vintage stores in Austin and it’s quickly becoming a favorite of all mid-century modern furniture fans in town. This time on Vintage Views, we talk with Dini and Amy, owners of Remixologie. Tell us a little bit about Remixologie. Do you have a specialty or do you sell anything that's mid-century modern? 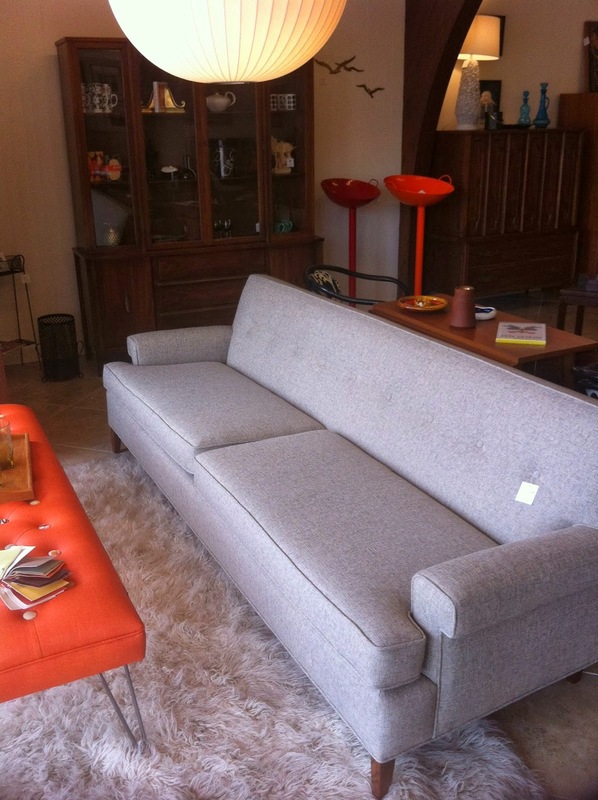 Dini: Remixologie specializes in mid-century modern furniture and accessories for the home. Our goal is to make everything ready to go into its new home. So we refinish, reupholster, polish and clean each item depending on what it needs. We try to stay away from kitsch, even though it can be really fun, and stick with beautiful vintage items that would suit a modern home as well. One question we ask ourselves when editing is, "Would we have this in our own home?" If the answer is no, it doesn't go in the shop. Our store is really a reflection of us. We fill it with things we like, we welcome and speak to customers as though they were coming into our home. We want it to be a friendly and comfortable place to visit. Amy: We also have some new items to round out the mix. We carry Modernica products. The're the manufacturers of the George Nelson Bubble Lamps and the original Eames-style fiberglass shell chairs. Not knockoffs, but the real deal; made on the original molds and machinery. We also have a well-edited selection of jewelry and gifts, and some kids items too. 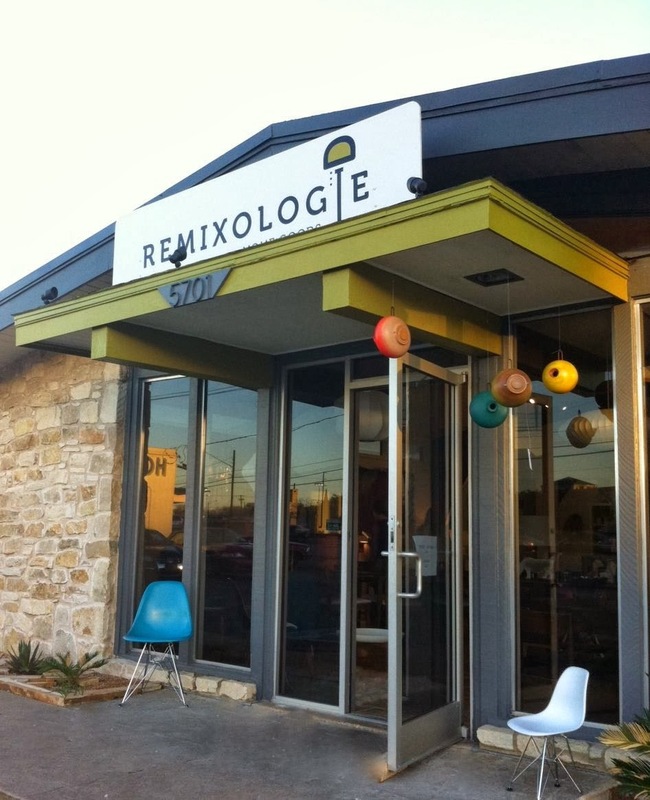 Remixologie is fairly new to the vintage scene, opening in January of 2013. Tell us about the path to opening your own MCM store. Dini: Well, Amy and I met on Craigslist. I bought a couple pieces from her for my house. We both love MCM and we hit it off, so I held onto her email address. When a friend of mine mentioned that he had a booth at the Austin Antique Mall, I thought I should look into doing that myself, but I was nervous to go it alone. So I contacted Amy and she was up for becoming partners. Our one booth quickly turned into two and we had gained such a following in a such short time, that we thought maybe we should look into opening our own store. We casually started browsing retail locations and within a week had signed a lease. Then we were like, "OK, there's no turning back now. Let's do this!" Amy: Actually the first piece that Dini bought from me just made it into the store earlier this year. It was a crazy cool lounge chair that needed a makeover. It had been in her garage for a couple years waiting for rehab. It turned out great and ended up going to a nice couple in Brentwood. How often do you get new things in? Dini: All the time. We have a small shop, so it's important for us to keep the flow going so we can offer new pieces to our customers. There's a lot of work going on behind the scenes too, refinishing and bringing things back to life, so there are always pieces in the process that will soon be placed in the shop. And we're always looking for the next piece, so sometimes even we don't know what items may come our way. Amy: I would say that we probably add 10 pieces of furniture a week. We just added a "new arrival" section to our website to make it easy for customers looking for a specific piece. As soon as a piece comes into the shop it hits our website. And where do you find the items you sell? Dini: We get this question several times a day and the answer is: Everywhere. There is not one big MCM warehouse where we go to shop. (I wish!) We are constantly on the search. It's not easy. 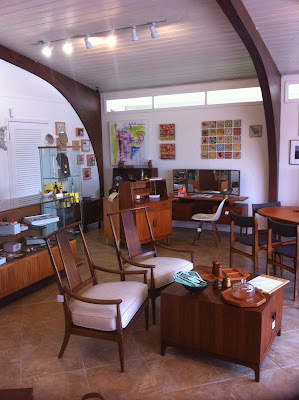 And it's important to note that when we do find furniture, it doesn’t look as beautiful as when you see it in our shop. Amy: I have dreams about that mythical MCM warehouse. Have any tips for people doing their own hunting at estate sales every weekend? Dini: I would just say to relax and have fun. There are diehard shoppers who line up, throw elbows and race through the house trying to find that deal. To me, that takes the joy out of the treasure hunt. Amy: Oops, I have been one of the elbow throwers. If you see a piece you like, don't think too long about it, otherwise someone else will snap it up. Have you seen a trend in vintage items people in Austin are looking for, either designer, style or type of piece (desk, dresser, etc)? Dini: We love our customers because they're like us, just people looking for functional furniture for their home, but with mid-century style. So our best sellers are usually everyday furniture, like dressers and dining tables. Oh, and people are always looking for a nice piece to put their TV on. What's your favorite piece to come through Remixologie so far? Dini: We had this absolutely gorgeous extra-long, walnut, tambour door Danish credenza. I think it was in the store about 2 days before one of our favorite customers snapped it up. She sent us pictures of it in her dining room, which made me happy because I could tell it found the perfect home. Amy: That question is a hard one because there have been several pieces that I’ve gotten attached to. If I have to choose just one: We had a very rare Raymond Loewy triple dresser. It was blonde wood with black drawers and had vanity built into the top middle drawer. I almost cried when it sold. A sweet young couple bought it as an anniversary gift to each other. That made it easier for me to see it go. And what's your favorite piece in your home? Dini: I have a Jens Risom slipper chair that I found and recovered in striped Paul Smith fabric. I almost don't want anyone to sit on it, but have to remind myself that it is actually a chair. Amy: I have an unmarked walnut wardrobe that has a cubist feel to it. I have had it for years and still love it as much as I did when I first found it. 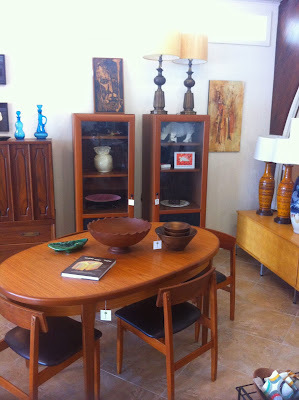 Do you have a piece that you've been looking for, but haven't been able to find yet, either for yourself or the store? Dini: I like to be zen about it and let things come as they may. If you put too much pressure on yourself looking for it, you'll never find it. And you find other things that you never expected. That's part of the fun. Amy: I would love to find another Raymond Loewy triple dresser. This time it would live at my house. Sounds like a similar theme to how I got started and probably a lot of others. I too am all about making sure everything is in great condition and ready to go home. I will definetely stop in and say hi the next time out Austin way!